An efficient and versatile alternative for areas difficult to access, work at height utilising rope access techniques provides a proven method of achieving a safe working environment, developed by the Industrial Rope Access Trade Association (IRATA) in the late 1980’s for the offshore Oil and Gas industry. 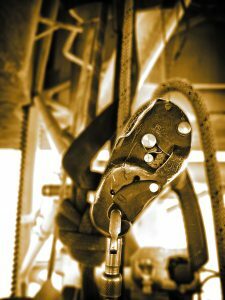 As an IRATA member company and strong advocate of using rope access practices, SKN are constantly striving to extend the boundaries of what tasks can be performed through these techniques. SKN provide highly competent rope access level 1, 2 and 3 technicians, also proficient in various other disciplines including electrical & instrumentation installation, inspection, repair & maintenance; construction; rigging; painting and blasting. Working within associate guidelines and to documented ISO accredited procedures, we utilise industry leading rope access technology and hardware as part of contracts or stand-alone projects. Unlike traditional methods of working at height, rope access eliminates the need for access machinery meaning a smaller environmental footprint, offers systems that are installed and dismantled quickly and causes minimal disruption, meaning less downtime. Rope access also involves reduced staffing levels and duration of work scopes, ultimately cutting costs for our clients.